Until now, creating a data-based, football betting system required programming skills, tons of spreadsheet data and hard work. Not anymore! With BetSuitePro, anyone can create a betting system within minutes. Select a market and name your system. Choose from over 40 different filters and check for strategies that have proved profitable in the past. BetSuitePro will do the hard work instantly and find the current games that fit your criteria. Browse Shared Systems to find and copy a profitable system, and you’ll start getting picks for it as soon as a game matches your system. That’s the quickest way to benefit from research made by other BetSuitePro community members. 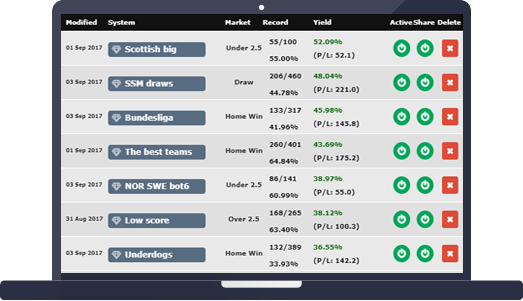 With our easy to use interface, you can quickly adapt your portfolio to your betting style. Set up your systems and you will receive instant notifications for the current matches that fit your systems. Ready to create your systems? 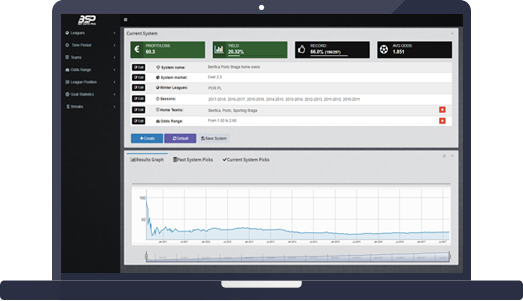 BetSuite Pro will do the hard work instantly and find the current games that fit.